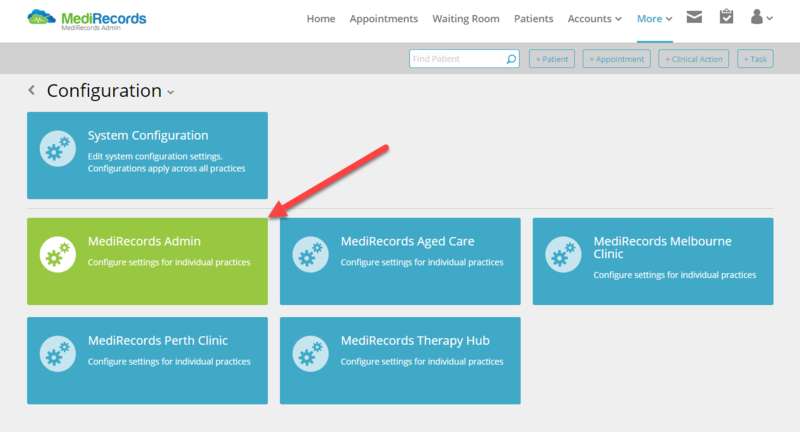 This article will cover how to setup eRx (for e-prescribing) in MediRecords for the first time. 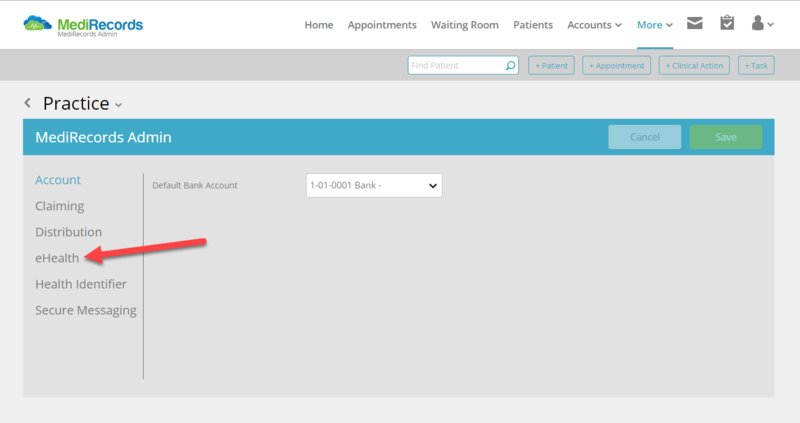 To setup eRx, you will need to register yourself on the eRx website and add your HPI-O (Healthcare Organisation) certificate, and the certificate associated with the Health Identifier (HI) Service to your practice configuration settings. Each of these steps will be covered individually in this article. 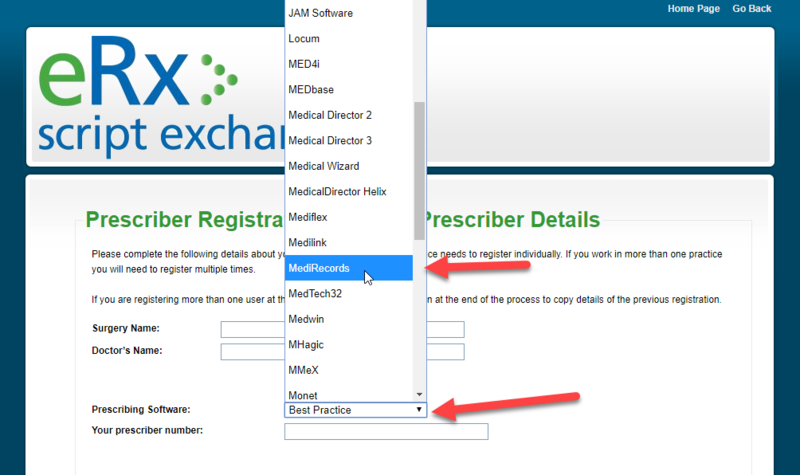 Before you can setup eRx in MediRecords, you will need to register yourself for e-prescribing on the eRx website. To register, go to www.erx.com.au and click Register NOW in the right-hand corner of the page. If you just registering yourself or a single doctor at the clinic, click I'm a Doctor, and complete the registration process. 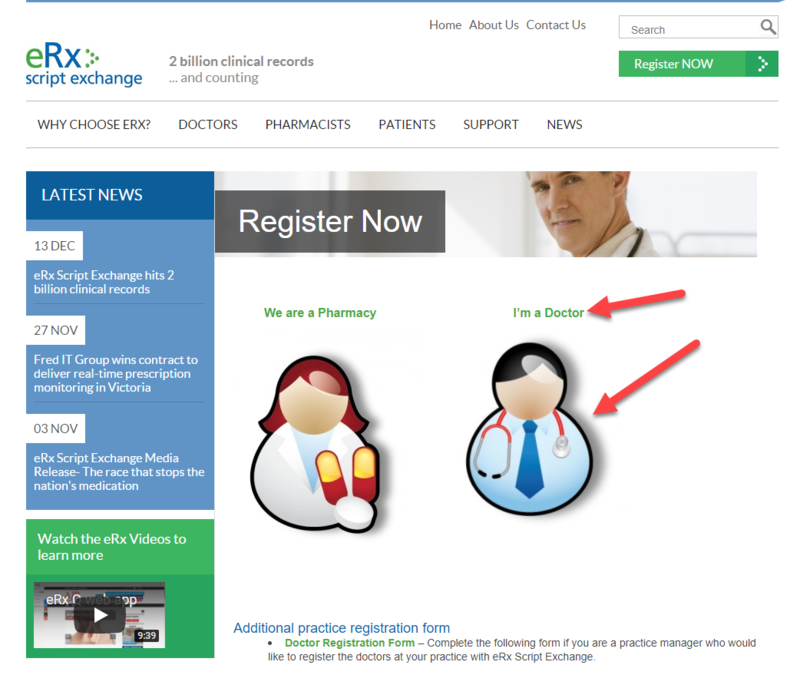 If you are a practice owner or practice manager, registering multiple doctors' for eRx at once, click Doctor Registration Form. 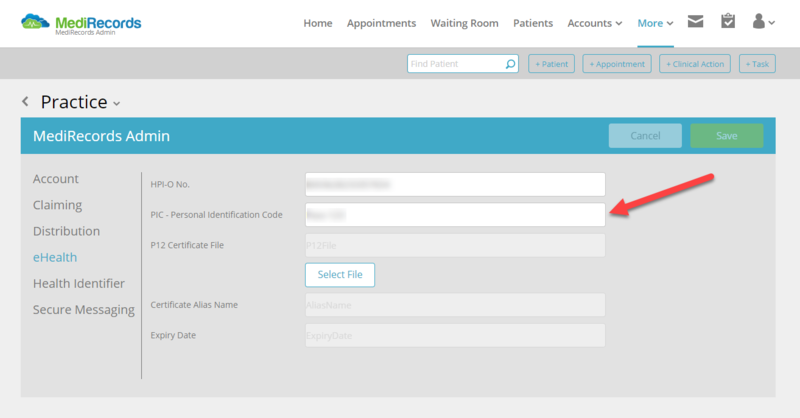 When completing the form, remember to select MediRecords as your clinical software provider. Once you have completed and submitted your registration form, please allow 1 to 3 days for eRx to process the application. When the application has been approved, you will be emailed your eRx ID and other necessary information used in setup. 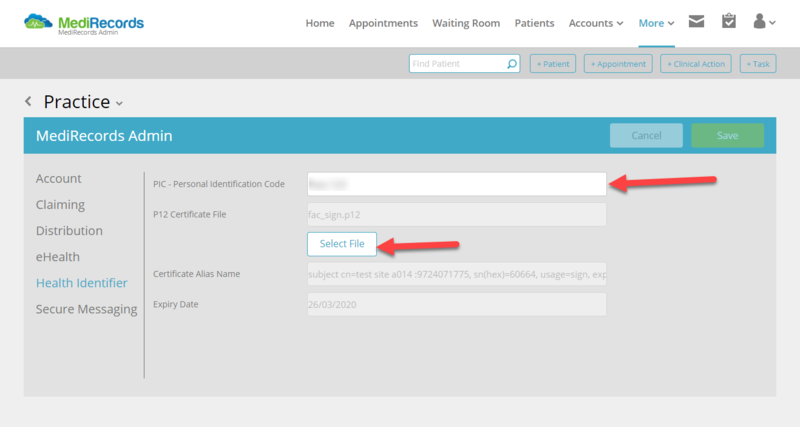 The eRx ID needs to be added to your profile in MediRecords, in the Identifiers section of the User Settings. To open User Settings, click More at the top of the page to reveal a drop-down list, and then click Settings. Click ERX ID and type in the eRx number (which MediRecords will provide to you). You are now ready to add your HPI-O and HI certificates to MediRecords. Once you have added the eRx ID to the provider's profile, please send an email to the MediRecords Support Desk (support@medirecords.com) to advice that it has been completed. 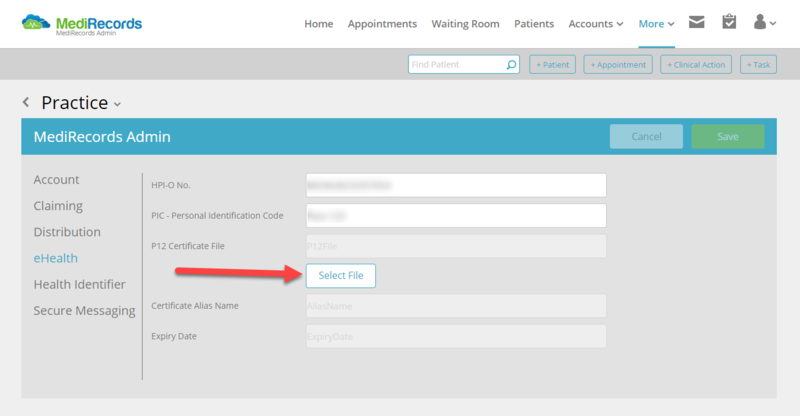 eRx ID's need to be activated by MediRecords before they can used for e-prescribing in the MediRecords App (patient mobile app). *NOTE: If you are already accessing My Health Record in MediRecords, then you can skip this step. The HPI-O and HI certificates would have already been configured at the time My Health Record was set up. Before you can begin e-prescribing, you need to register your practice with Medicare and obtain access to the Health Identifier (HI) Service, and obtain a Health Professional Identifier - Organisation (HPI-O) PKI certificate. 1) Access to the Health Identifier (HI) Service can linked to an existing PKI Certificate registered for your practice. Once access is obtained, the Health Identifier access number can be linked to your existing Medicare billing certificate, or to a NASH (National Authentication Service for Health) certificate. Click here to locate the Medicare form to link access to the Health Identifier Service to either a Medicare Billing certificate, or a NASH certificate. Click here to locate the Medicare form for applying for a NASH PKI Certificate. 2) You will need to complete the Healthcare Organisation registration form on the Human Services website. Applications can be completed either online or by mail. Once you have completed registration, you will be provided with an HPI-O Number and an electronic Certificate which needs to be uploaded to your practice profile in MediRecords. Once you have the HPI-O and HI certificates and pass-phrases you can configure your practice settings to begin using e-Rx. 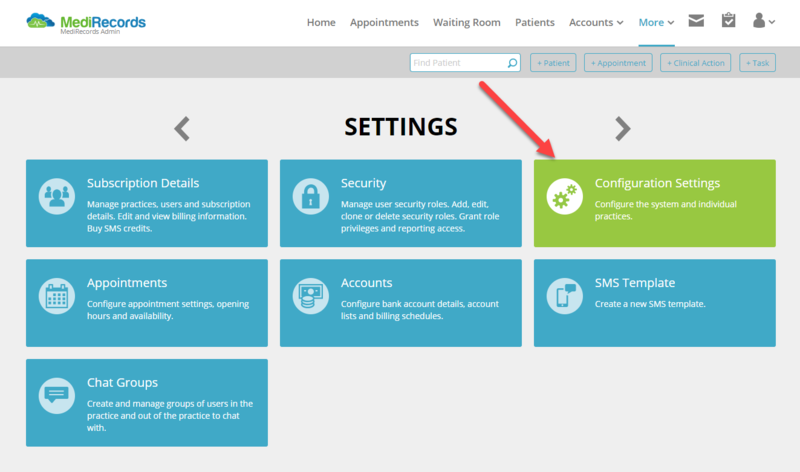 You will need to upload HPI-O certificate into your eHealth configuration settings in MediRecords, which is located within Practice Configuration in Settings. To open Practice Configuration, click More to reveal a drop-down list, and click Settings. Click the field next to PIC - Personal Identification Code and enter the code that you received with your HPI-O Certificate. To upload your HPI-O Certificate, click Select File to open a file explorer window. Navigate to the location of the certificate (typically it will be stored on a CD, which was provided by Medicare). Click on the name of the certificate (called fac_sign.p12) and click Select or Open. Click Upload File to add the certificate to the practice's eHealth profile, and then click Save. Once the file has been uploaded, the practice's HPI-O Number will automatically be populated to the HPI-O No. field, along with a Certificate Alias Name and Expiry Date, which are all digitally stored on the HPI-O certificate. Do not exit from Practice Configuration, as you now need to upload your Health Identifier certificate. Similar to HPI-O, click PIC - Personal Identification Code and enter your HI Certificate code. Then click Select File to open a file explorer window. Navigate to the location of your HI Certificate (called fac_sign.p12), and select it for upload. Click Upload File, and then click Save. Once the certificate has been saved, the Certificate Alias Name and the Expiry Date will automatically be populated on the form. The setup process for eRx is now complete. 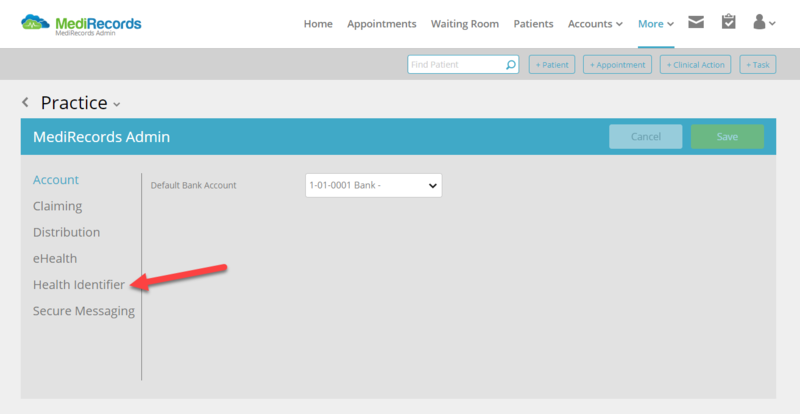 It is important that you also review our article for eRx Patient Settings, so that you can learn how to invite and configure a patient record so that they can receive their prescriptions via eRx.